I was beginning to wonder if Spring would ever arrive but as always it has. Finally the fear of frost has passed and we can start getting serious about gardening. Todays posting will be a few miscellaneous items about the garden and other things. Our day today has already been planned and as soon as I leave this computer I’ll be back playing in the dirt once again. My first item concerns something I mentioned in a recent post about my new favorite drink, the Hot Pepper Margarita. I collected all of the ingredients needed to get things rolling and here it is. This photo was taken after two days of the peppers soaking in tequila. I can already seen the peppers losing their colors as the tequila bleaches them and it won’t be long before it will be ready for use. One more week and then I’ll strain the tequila and put it back into it’s bottles. Then the fun can begin. I began planting in earnest this week with zucchinis, cucumbers, onions, kohlrabi’s, and eggplant. Later today I’ll finish up with tomatoes, jalapeno peppers, Serrano peppers, Thai peppers, and Kung Pao peppers. Now that the nights are warming up the peppers should flourish. Here’s an update wide angle photo of the garden as it begins to grow. No, I’m not celebrating computer Spam, that would be stupid. I’m celebrating my all time favorite meat product much loved and much hated around the world. I began my love affair with SPAM while in the service of our great country. The Army introduced me to discipline, mean DI’s (drill instructors ), forced marches, and much, much, more including SPAM. My love for SPAM was one of the only things I left the Army with except for a bag of really ugly olive green clothing. Many people, my better-half included, hate SPAM. I’ve never understood why because it’s freaking delicious. Since this blog is dedicated to all categories of trivia I thought it only fair you learn something about SPAM today on it’s birthday. I collected a great deal of information from around the Net and elsewhere on this subject and here it is. George A. Hormel & Co introduces SPAM on this date in 1891 although it wasn’t marketed until 1937. During WW II, Hormel sold more than half of its output to the U.S. government, which supplied SPAM to the armed forces of the U.S., and also to the U.S.S.R. under the lend-lease program. The 1 billionth can of SPAM was sold in 1959. The 6 billionth can was produced in 2002. The 7 billionth can was sold in 2007. In 2012 SPAM was being sold in more the 44 countries. Hawaii ranks highest amongst the states in SPAM consumption, downing seven million cans a year. Found in grocery stores, on the McDonald’s menu, and featured at high-end restaurants, Spam should probably be added to the state flag. Richard LeFevre holds the world record for eating SPAM by eating 6 pounds in 12 minutes. In the United States alone, 3.6 cans of SPAM are consumed every second, making it the number one product in its category (canned meat) by far. On the island of Guam, more than eight cans of SPAM are consumed by every person each year. West Yellowstone sponsors the ‘SPAM Cup’ cross country ski race, with the winner receiving one can of SPAM. In addition to the U.S., spam is produced in 7 other countries: Australia, Denmark, UK, Japan, Philippines, South Korea and Taiwan. SPAM is distributed in more than 50 countries. The SPAMJAM Cafe opened in February 2004 in the Philippines. Except for hot dogs, French fries and desserts, all other menu items are made with SPAM, including SPAM Burger, SPAM Hero, SPAM Club, SPAM Spaghetti, SPAM Baked Macaroni, SPAM Nuggets and SPAM Caesar Salad. SPAM even has a mascot — Spammy, the miniature pig. In 1991, for its 100th anniversary, Hormel Foods opened the First Century Museum. The exhibit of SPAM memorabilia quickly became the most popular. SPAM has earned a place in pop culture history partially thanks to the Brits. The canned creation made its television debut on "Monty Python’s Flying Circus" in 1970. A collector’s edition SPAM — Stinky French Garlic — was introduced to celebrate the opening of "SPAM lot" in London. Not shockingly, the stinky SPAM tasted far better than anything else in the culinary-challenged country. So there you have it. Everything you ever needed to know about SPAM but were afraid to ask. I love it so much I always have at least one can hidden away in the house. Once my better-half goes to work I’ll get it out and prepare any one of a dozen recipes I love. My all time favorite is my version of SPAM Fried Rice and it’s to die for. I hate missing a scheduled posting but it happened this week for the first time in almost a year. The weather turned bright, sunny, and beautiful and I got swept away with garden preparations and grass cutting. By the time I was finished it was much too late in the day to sit down and post something. I’ve been waiting five long months for these first spring days and I enjoyed the hell out of them. Along with all that enjoyment came the inevitable aches and pains. The morning-after reminded me just how many muscles I have in places I’d forgotten about . . . and they weren’t happy. Oh so sore. My better-half and I spent some time and money this week visiting a number of local nurseries and were able to purchase almost everything we needed for the initial plantings. We bought, cucumbers, zucchini’s, various hot pepper plants, pea pods, spinach, cherry tomatoes, and even some early kale plants. Add to that a few dozen marigolds for a little color and we’re ready to start planting next week. We also picked up quite an assortment of herbs to replace plants lost over the winter and a number of new ones as well. I even got a little carried away and started transplanting a few things from the flower garden to a more prominent position near the driveway. It was a backbreaker trying to get this bush moved but it appears to have survived the trauma and is doing well. 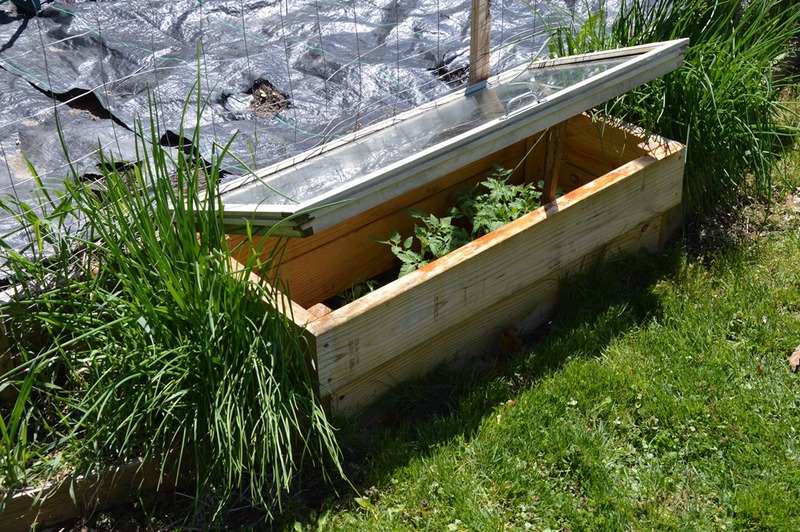 We’ve filled our cold frames with plants and they’ll remain there until I’m sure the weather will remain warmer and no frost in the forecasts. Regardless everything should be planted on or about Memorial Day. Then it’ll be time to relax and let Mother Nature do what she does best. These few photos are the first of many I’ll be posting this summer. We should have a really productive garden which will hopefully fill our pantry shelves for next winter. I NEED TO ORDER MORE BEN-GAY!